During the month of June the LGBT community celebrates diversity, cultural accomplishments and influence, and the strides that have been made politically and socially. The month also highlights that there is still far to go before the LGBT community achieves full equal rights and acceptance. Around the world, the rainbow flag, designed in 1978 by American artist, gay rights activist, and U.S. Army veteran Gilbert Baker, flies proudly over a variety of events, including parades, marches, concerts, book readings, parties, and workshops. Julián and his abuela are riding the subway, when three women dressed as mermaids enter their car. The women’s shimmery aqua dresses, complete with flowing tail, capture the young boy’s attention because “Julián LOVES mermaids.” As they move down the track, one of the mermaids combs through her long hair; another, her head adorned with a filmy, seaweed-red pouf decorated with jewels fixes her tail; and the third waves at Julián, who smiles back. Copyright Jessica Love, 2018, courtesy of Candlewick Press. In Julián’s imagination the aqua dresses become a wave engulfing him in the frothy sea. He frees himself from his shorts and tank top while his tightly curled hair, loosens and floats upward. A ray with a rainbow of fish, jelly fish, eels, and an octopus following it its wake surround Julián, and when they’ve all passed by, he’s magically grown a pink tail with a golden fin. He swims, flips, and whirls in the water and then meets a fantastical fish who presents him with a shiny necklace. On their doorstep, Julián tells his abuela that he too is a mermaid. The older woman takes this in without expression. Inside, as Julián’s abuela takes a bath, Julien sets off to make his imagination a reality. He frees himself from his shorts and t-shirt, harvests fronds from his abuela’s palm tree and flowers from her vase for a headdress, applies her lipstick in the vanity mirror, and ties the sheer, delicate curtain from her window around his waist for a tail. With the costume complete, Julián is reay to swim just as his abuela steps into the room. She takes one unreadable look at Julián, says “‘Oh’” and “‘Uh-oh’” and leaves the room. Julián folds his arms, looks uncertainly at his “tail,” and checks out his face in the mirror. In a moment his abuela is back, dressed and ready to go out. She holds out her hand to Julián and presents him with a pearl necklace. She takes Julián’s hand and leads him outside and down the sidewalk. Julián holds his abuela’s arm and walks beside her with his head held high. They meet up with a crowd of men, women, and children dressed as mermaids and other sea life. At first Julián holds back, but Abuela holds out her hand. “‘Like you, mijo. Let’s join them,’” she says. And as they join the parade—Julián revels in his freedom while he dances right behind the three aqua mermaids. Jessica Love’s joyful story will raise a lump in your throat. Perfectly constructed with a minimum of text and facial expressions that reveal so many nuances of wonder, awareness, and acceptance, Julián Is a Mermaid offers young readers and adults a rich tapestry for discussing emotions, memories, and experiences related to growing up, identity, and finding ones place. Love’s gorgeous color palette brings the beauty of the sea and the creativity of the imagination fully to life. Julián’s abuela is a marvel of understated strength. Her seemingly strict gaze on Julián provides a bit of humor and the suspenseful turning point in the story, but as her eyes soften—just a little—when she takes Julián to the parade, readers will know that not only does she accept, but she truly understands. Julián knows this too, which is dynamically demonstrated when Abuela appears as the generous fish in his daydream. With so many people around the world striving for their voices to be heard, Julián is a Mermaid is an important gem to cherish and share. Everyone loves mermaids! 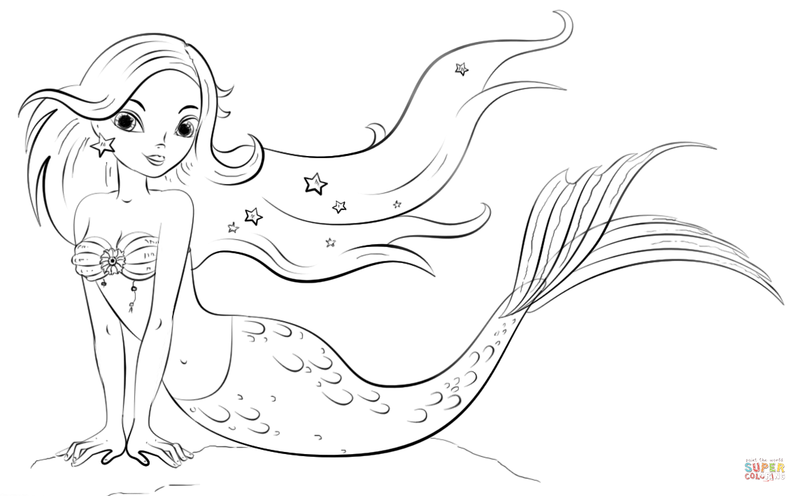 Grab your crayons or pencils and even some glitter and enjoy this printable Mermaid Coloring Page!